Can Improve Circulation - The Discus T Footrests are designed to provide a resting platform for users seated on average or higher than average seats. Because circulation can be cut off on the back of the thighs when a seat is too high, it is important to have a footrest that can be adjusted to a height suited to the seat height. 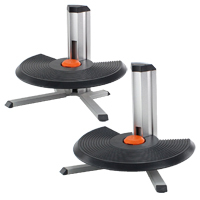 The Discus Footrest is available in two height ranges, 2" - 5.9" and 5.9" - 9.8". Supports Proper Foot/Angle Alignment - Many office workers sit with one foot forward of the other, putting this foot into a position called plantar flexion. Over time, sustained plantar flexion can cause the calf muscles to become tight and stiff which, in turn, can lead to a range of uncomfortable symptoms in the foot. 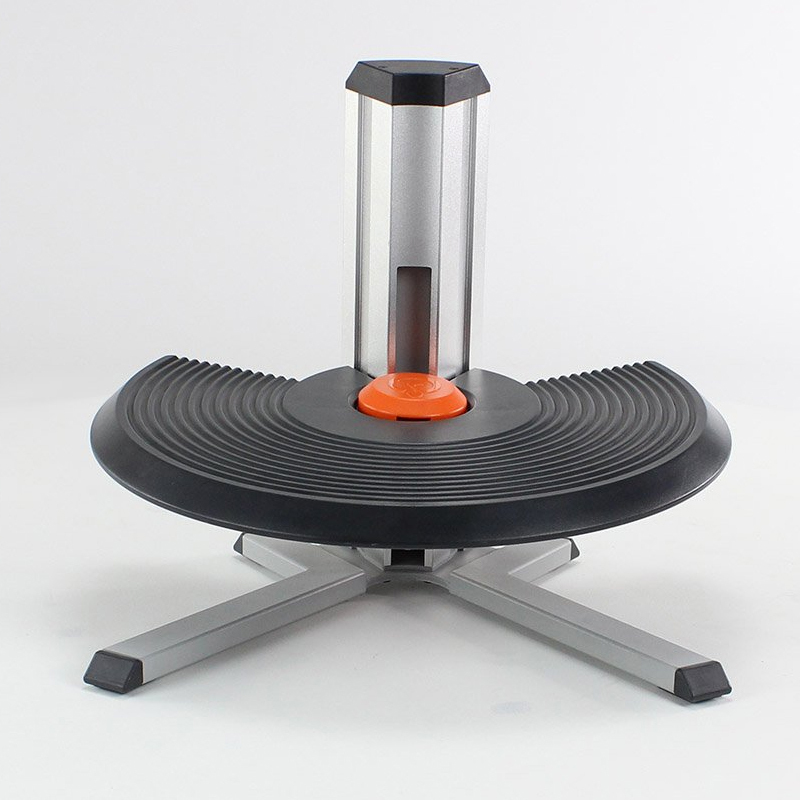 The Discus T Footrest features an angle adjustable platform that ensures users are not in the position of plantar flexion when resting their feet. 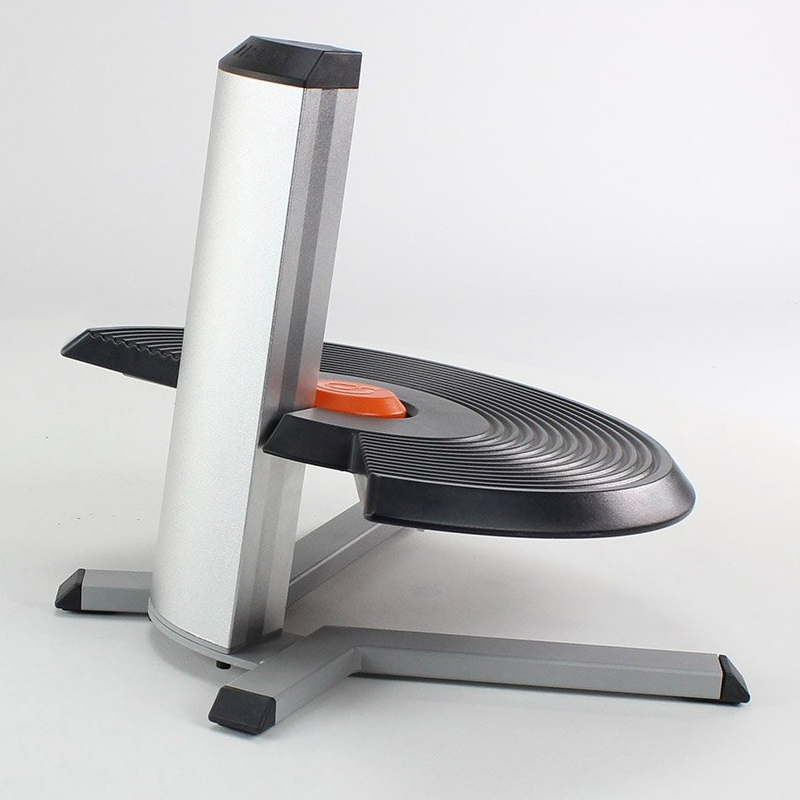 Improves Upper Body Posture - The Discus T Footrest provides users with a stable and supportive surface that encourages them to correctly utilize the back of their chair rather than "perching" on the front edge of their seat. This improved posture can reduce the risk of upper back, shoulder and neck pain. The Discus Footrest is available in 2 height ranges so users can select the model that best meets their seating requirements. 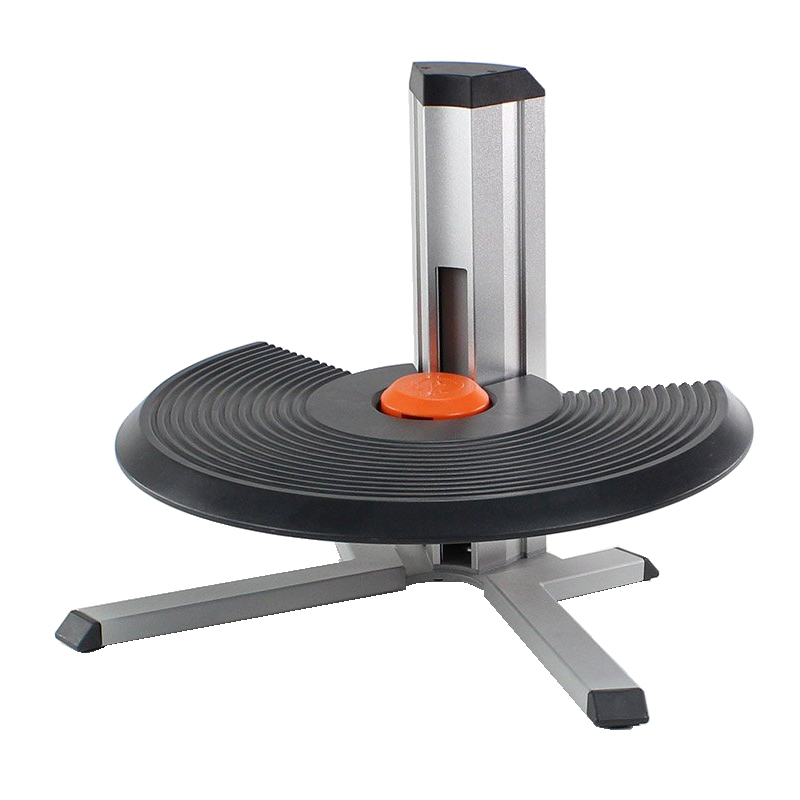 Easy Adjustment: Height adjustment of the Discus T Footrest platform can be easily accomplished while seated. The large release button is located at the centre rear of the platform, easily accessible by either foot. Pressing down on the button unlocks the gas cylinder that provides the upward force necessary for upward adjustment. The user presses down with their foot (or feet) to move the platform to a lower level. Releasing the button locks the platform at the new height. 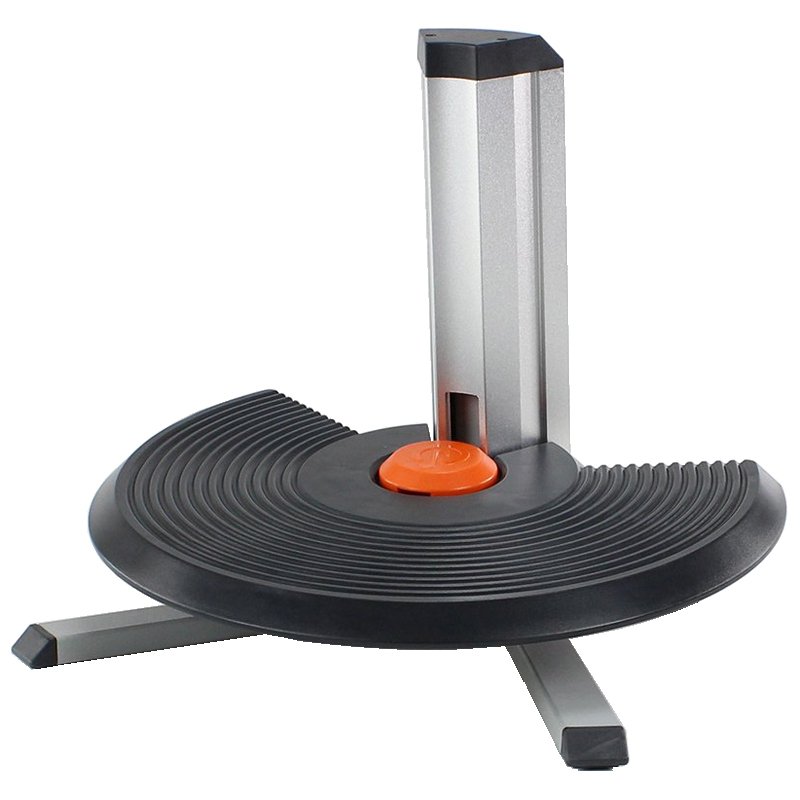 Height Adjustable: The two models of the Discus T Footrest offer two height ranges, 2" - 5.9" and 5.9" - 9.8". The lower range of the Discus T 150 will meet the daily needs of the majority of users. The Discus T 250 offers a higher range suitable for those who are sitting on elevated chairs and require a greater elevation of foot support. Non-Locking Tilting Platform: The Discus T Footrest platform offers a free tilting range from approximately +5° to +30°. Oversized Foot Platform: The large three-quarter disc-shaped platform is 20" W x 14" D (center) x 16" D (sides). The large surface offers plenty of support to feet of any size. Ridged Surface: The surface of the Discus T Footrest has curved ridges to help keep the feet in position. Robust Construction: The Discus T Footrests are sturdily built and designed to offer long life and reliability. 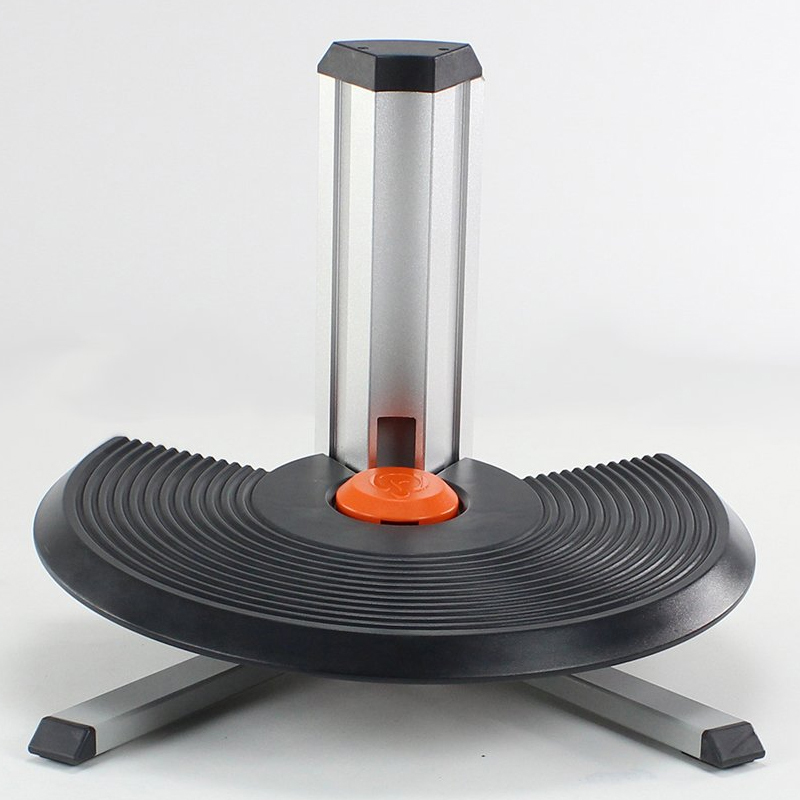 Note: The platform on the Discus T Footrest is an arced shape, comprising approximately 240° of a complete disc. Materials: Sturdy Extruded Aluminum Frame and Base, ABS Plastic Platform. Set your Discus T Footrest to the correct height. Your feet should be supported at such a height that your feet are resting comfortably on the footrest without tilting the chair forward or having to stretch to reach the footrest. However, ensure that the platform is not set too high as this will lift the thighs off the seat pan of the chair, reducing overall comfort while also tilting the pelvis backwards and adding undesired pressure to the lower lumbar region. DISCUST150 Discus T 150 Footrest, Adjusts from 5-15 cm. DISCUST250 Discus T 250 Footrest, Adjusts from 15-25 cm.